On February 5th, 2017, the world tuned in to watch Tom Brady lead his New England Patriots to the biggest comeback in NFL Super Bowl history. Trailing by 25 points midway through the third quarter made the chances of Brady, and longtime coach Bill Belichick, winning their fifth Super Bowl ring seem all but impossible, yet somehow the man many consider to be the greatest quarterback in NFL history made it happen. How, we may wonder? Sure, he has been blessed with the physical attributes to succeed at the highest level, but what truly distinguishes him from the rest is what is found between his helmet. It’s primarily due to Brady’s psychological makeup, the champion’s mind, that allowed him to overcome all odds and once again capture the illusive Lombardi Trophy. By dissecting the psychological characteristics that make up the mindset of champions, and exploring our culture’s greatest sports heroes, we have a chance to develop the champion’s mind within. While we may not have the physical attributes to succeed on the field, it is certain that by cultivating the mental characteristics of true sports legends, we can increase our chances for success across a wide variety of life areas. Passionate: It is certain that the starting point of all great sports achievement is an unquenchable passion for the particular sport. Unless an individual is completely immersed and in love with what they are doing, the likelihood of them rising to the top remains slim to none. Moreover, it is directly from an individual’s passion that the other mental characteristics of the champion’s mind develop. Committed: What comes out of an individual’s deep-rooted passion for a particular sport, is a natural desire to succeed at all costs. Because athletic champions have a true love for the game, they are able to stay committed to the process of improving themselves, and their teams, day-after-day without losing their focus. It is by making this commitment to daily incremental improvement, regardless of their initial success, that individuals are able to transform themselves into true champions. Selfless: Rarely, if ever, do we witness teams of selfish ‘I’-first players rise above the competition to be crowned champions. Assuredly, deep within every great champion’s mind is an unquestioned belief that the goals of the whole take precedent over individual accomplishments or accolades. History’s greatest players and coaches, regardless of the sport, all possess a deep found desire to help their teams win, even if it comes at their own expense. Fearless: Fearlessness is one of the most important component of the champion’s mind and it is from this psychological characteristic that individuals are able to overcome even the most insurmountable odds. For truly great sports figures, fearlessness is a natural byproduct of determination, preparation, and an unwavering belief in one’s self. Additionally, fearlessness comes when individuals use their previous mistakes and failures as learning opportunities that spring them towards championship levels. Poised: In nearly every sports game or competition, there will be particular moments when pressure reaches heightened levels that cause many to crumble. During the most stressful circumstances, it is only the true champions that are able to stay cool and collective. While many people become overwhelmed, nervous, and clumsy at the most crucial times, champions are able to stay focused in the present-moment and remain unwilling to let externals distract them from doing whatever it takes to get the job done. As you can see, there are a number of important psychological components that merge together to create the champion’s mind. By either naturally being predisposed to these qualities or developing them within themselves, truly legendary athletes are able to rise above setbacks and obstacles on their way to reaching the pinnacle of success. Jackie Robinson will forever be remembered as being the man who broke the color barrier in baseball, paving the way for countless other African-Americans to pursue their dream of playing professionally. Considering the massive amounts of racial prejudice shown to him every time he laced up his cleats, it would’ve been impossible for Robinson to amass the career statistics that he did without having a deep love for the game. Over the course of a ten-season career, Robinson accumulated a .311 batting average, hit 137 home-runs, had 734 runs batted in, stole 197 bases, and gained the reputation of being a fierce competitor who brought it to the field everyday. Throughout the history of college football, there have been few, if any, coaches who have been envied for their success like current University of Alabama coach Nick Saban. Over the course of a 21-year college coaching span, at four different schools, Saban has amassed a 210-61-1 record and won five national championships, with four of them coming since 2007. Saban will be the first to admit that his unmatched work ethic and dedication to focusing himself and his team on the task at hand are what separates him from the rest of the pack. There are few inspirational sports stories that can compare to that of the 1980 U.S. Olympic Hockey team’s gold medal run at the Lake Placid Olympics. Most notably, the American’s game against an overpowering Russian team, now commonly known as the Miracle on Ice, will forever be cherished as one of the most inspirational moments in American sports history. Thanks to the leadership of head coach Herb Brooks, the United States team of all amateur players was able to selflessly come together and beat a Soviet team, made up of all professionals, who had beat them 10-3 only two weeks earlier. Michael Jordan will forever be remembered as one of the most decorated American sports icons. Throughout his 15-year playing career, Jordan amassed over 32,000 points, won the MVP five times, and led the Chicago Bulls to six NBA Championships. Thanks to his relentless and fearless style of play, Jordan remains a cultural icon whose beloved by nearly all. Although Jordan’s success at the highest level is undeniable, his path to greatest was one filled with obstacles, setbacks, and failure. In 1978, Jordan wasn’t chosen to represent his high school’s varsity basketball team, and even though this devastated him at the time, it is from this experience that led to his tendencious and fearless style of play. There are many sports fans across the world, who no matter who is playing will be interested in being a part of basketball history. Many people tune in to women’s basketball, as well as watching some of the top basketball players in the industry on the court. If you are planning on tuning in to basketball this season, in particular women’s basketball, be sure to look into sites such as https://www.interbasket.net/brackets/ncaa-tournament/womens/ to print out your very own version of the tournament chart. This way, you can make your predictions on who you think will be victorious after each game. Super Bowl 51 was just one of many examples showing the unshakeable levels of poise Tom Brady operates with, even when facing the most daunting of challenges. According to Elias Sports Bureau, there has been 2,656 games in NFL history where a team was losing by 25 points or more, and only seven of those teams, 0.2% of them, were able to manage to do the unthinkable. 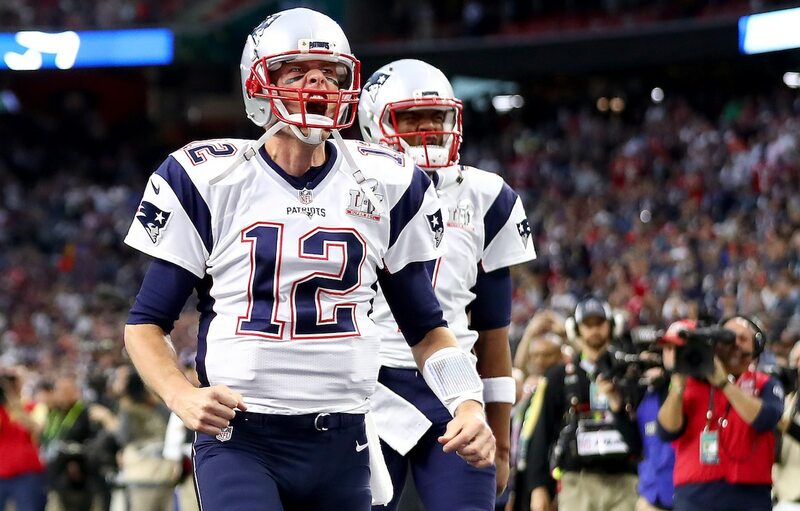 Throughout his career, Brady has amassed 39 fourth quarter comeback victories and cemented his legacy as the most poised quarterback to ever play the game. The most important factor in cultivating the champion’s mindset within yourself is to find something that you’re truly passionate about. Your ability to develop the other four mental characteristics will be dependent on if you have true conviction and belief in the ultimate goal. This means that for career aspirations, you’ll need to be deeply passionate about your work, and for personal development and fitness goals, you’ll have to determine the reasons why success is so important. As Jackie Robinson’s story shows, if an individual has passion and conviction while pursuing their goals, their chances for success greatly increase. On the path to achieving with the champion’s mind, it will be imperative for you to make an unwavering commitment to succeed. By researching inspirational individuals that have made a historical difference with their lives, across any given field, it is clear to see that setbacks and failures are undoubtedly a part of the achievement process. Fortunately, if you aim to succeed in areas that you are passionate about, your levels of commitment and resilience will become much higher. Additionally, it will be vital to utilize a process similar to Nick Saban and focus on incremental improvement in the present-moment, instead of worrying about the end result. There is little denying the fact that what a single man can accomplish alone doesn’t come close to matching the impact that can be made by a group of individuals working together as one. Not only should you be willing to work with others, you should actively search for likeminded individuals who are similarly passionate about the things that you desire. When you surround yourself with likeminded people who want to succeed in the same ways, the whole group benefits as you push each other towards success. By developing a team-first mentality, like the one Herb Brooks instilled into his players, your chances for success become multiplied with each individual you bring onto your team. To live your life with the fearlessness possessed by Michael Jordan, you’ll have to transform your beliefs about what failure actually means. Instead of looking at setbacks as dream-crushing blows, you’ll need to begin recognizing them as important learning opportunities that will lead you to where you want to be. It is important to remember that each and every great success story has tales of failure woven within, and if you want to succeed with the mindset of all great champions, you’ll need to push your limits until you reach a place where the fear of failure and rejection doesn’t stop you from taking the chances that are needed to achieve. Two great strategies for increasing your fearlessness are the Cognitive Behavioral Therapy (CBT) treatment exercises of behavioral experiments and behavioral interventions. Having the ability to handle stressful situations with poise, calmness, and confidence is the one aspect of the champion’s mind that is most challenging for most. This ability, however, can be cultivated within and is directly related to preparation and present-moment focus. You can be assured that each and every person who has succeed on the biggest stage has tirelessly worked and rehearsed for the big moment. This means that to enjoy the unshakeable poise of Tom Brady, you’ll have to incessantly prepare until your beliefs in your own ability become unbreakably strong. One step that you can take is to rehearse stressful situations in environments that resemble the real-life circumstances as closely as possible. Additionally, to increase your abilities to stay in the present-moment, you can begin practicing mindfulness, which has become a staple in the world of sports psychology.